With light-reflecting white walls, floor-to-ceiling windows and a wide, gleaming terrazzo floor curving along the corridors and two-story pedestrian bridge that spans Clifton Road, the new hospital tower at Emory University Hospital looks like a set from a futuristic movie. 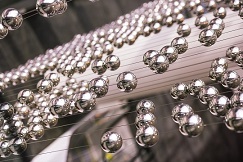 What isn’t immediately obvious, in all the steel, granite and glass, is the collective effort by dozens of teams to create a nurturing, people-focused environment. These collaborative teams, representing more than 300 individuals, worked together to create patient rooms, clinical work areas and dining facilities that reduce stress, foster healing and meet the needs of those visiting and working in the hospital. Teams looked at all aspects of the patient care process to determine how they could create a more healing and efficient environment to reduce the stress on families and enable the care teams to perform at their absolute best. No part of the patient experience was left untouched as teams considered everything from outlet and cabinet placement to installation of USB ports and the use of sliding “barn” doors to help make the bathrooms easier to access. The design team also worked with operational leaders to integrate different aspects that supported employee health and wellbeing, with a holistic approach that focused on an individual’s needs. “We were thrilled to work with the design teams to look at every aspect of the employee experience,” says Cynthia Hall, RN, Corporate Director, Employee Health & Centralized Leave at Emory Healthcare. “The new tower integrates more natural light, meditation spaces, lactation rooms and employee showers. We even put care into the design of our stairwells to promote employees using the stairs to increase their steps and daily activity.” Designers also put care into the placement of breakrooms that were placed further away from patient care areas, so that employees could truly get away during their breaks to decompress. With the first floors opening this July and August, it was time to put the planning to the test. Wednesday, July 28, more than 100 Emory Healthcare employees came together for a “Day in the Life” simulation event to test how the new space functioned. These simulations are designed to test whether the front-end planning has paid off to create an enhanced patient experience – and where there are still opportunities to make improvements. As each new floor of the tower prepares to open, teams will hold additional “Day in the Life” simulation events to ensure the clinical areas are ready to welcome new patients and their families. If staff really want to get away, they can head downstairs to the new Clifton Café, which will fully open in late August 2017. 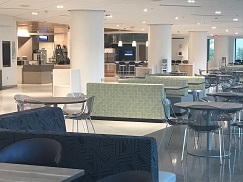 With bright, airy views of the Emory University Campus, the new café features an indoor herb garden and a chef’s table that will feature a breakfast and lunch bar. Even the layout of the new dining space was designed with consideration not only for the patient experience, but the needs of staff, as well. “Some of the feedback we have received is that dining in the cafeteria can be challenge during peak hours when clinical staff only have 30 minutes for their lunch breaks,” says Michael Bacha, executive chef at Emory University Hospital. In planning the new space, the design teams looked at how to improve the flow of guests through the different stations so that those on a time crunch can move through quickly, so they have time to savor their food before returning to patient care. They also sought to find a balance between creating a modern, open design that is warm and inviting. The dining space is reflective of the overall design philosophy of those planning the new tower space. When designing a built environment for healing, emotional health is just as critical a factor as physical health. That’s the Healthy Emory way.